Isoniazid is a synthetic, isonicotinic acid-derivative antituberculosis agent. Isoniazid usually is administered orally. The drug may be given by IM injection when oral therapy is not possible. The fixed-combination preparation containing isoniazid and rifampin (Rifamate®) and the fixed-combination preparation containing isoniazid, rifampin, and pyrazinamide (Rifater®) should be given either 1 hour before or 2 hours after a meal; the manufacturer states that Rifater® should be given with a full glass of water. 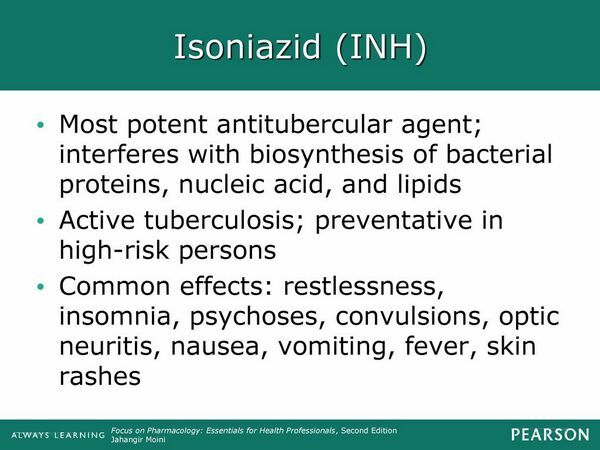 Oral and IM dosages of isoniazid are identical. In the treatment of clinical tuberculosis, isoniazid should not be given alone. The drug is considered a first-line agent for the treatment of all forms of tuberculosis. Therapy for tuberculosis should be continued long enough to prevent relapse. The minimum duration of treatment currently recommended for patients with culture-positive pulmonary tuberculosis is 6 months (26 weeks), and recommended regimens consist of an initial intensive phase (2 months) and a continuation phase (usually either 4 or 7 months). However, the American Thoracic Society (ATS), US Centers for Disease Control and Prevention (CDC), and the Infectious Diseases Society of America (IDSA) state that completion of treatment is determined more accurately by the total number of doses and should not be based solely on the duration of therapy. For information on general principles of antituberculosis therapy and recommendations regarding specific multiple-drug regimens and duration of therapy. The ATS, CDC, and IDSA recommend that when isoniazid is used in conjunction with other antituberculosis agents in a daily regimen, adults and children 15 years of age or older should receive an isoniazid dosage of 5 mg/kg (up to 300 mg) once daily. When an intermittent multiple-drug regimen is used for the treatment of tuberculosis, the ATS, CDC, and IDSA recommend that adults and children 15 years of age or older receive isoniazid in a dosage 15 mg/kg (up to 900 mg) once, twice, or 3 times weekly. Infants and children tolerate larger doses of isoniazid than do adults and may be given isoniazid in a dosage up to 10-20 mg/kg once daily, depending on the severity of the disease. The maximum dosage of isoniazid recommended by the manufacturers for children is 300-500 mg daily. The ATS, CDC, IDSA, and American Academy of Pediatrics (AAP) recommend that when isoniazid is used in daily multiple-drug regimens in pediatric patients, an isoniazid dosage of 10-15 mg/kg (up to 300 mg) daily should be used. The AAP cautions that use of an isoniazid dosage exceeding 10 mg/kg daily in conjunction with rifampin may increase the incidence of hepatotoxicity. When an intermittent multiple-drug regimen is used for the treatment of tuberculosis in pediatric patients, the ATS, CDC, IDSA, and AAP recommend an isoniazid dosage of 20-30 mg/kg (up to 900 mg) twice weekly. When isoniazid is administered as the fixed combination containing isoniazid and rifampin (Rifamate®) as part of a multiple-drug regimen for the treatment of pulmonary tuberculosis, the usual adult dosage of Rifamate® is 2 capsules (600 mg of rifampin and 300 mg of isoniazid) once daily. he ratio of rifampin, isoniazid, and pyrazinamide in Rifater® may not be appropriate in children or adolescents under the age of 15 because of the higher mg/kg doses of isoniazid usually given in children compared with those given in adults. For treatment of latent tuberculosis infection, isoniazid usually is given as the sole antituberculosis drug for a minimum of 6 months. Every effort should be made to assure compliance for at least 6 months, since preventive therapy of shorter duration appears to provide little benefit. If drug administration cannot be directly observed, the use of spot testing of urine for isoniazid metabolites has been recommended for assessing compliance. The ATS and CDC currently recommend a 9-month daily isoniazid regimen or, alternatively, a 9-month twice-weekly isoniazid regimen for adults regardless of HIV infection status. Continuing isoniazid therapy for latent tuberculosis infection for longer than 12 months provides no additional benefit. It also is recommended that isoniazid therapy for latent tuberculosis infection be continued for 9-12 months in HIV-infected infants and children. The ATS and CDC state that completion of therapy for latent tuberculosis infection is determined more accurately by the total number of doses and should not be based solely on the duration of therapy. The 9-month daily isoniazid regimen should consist of at least 270 doses administered within 12 months (allowing for interruptions in the usual 9-month regimen) and the 6-month daily isoniazid regimen should consist of at least 180 doses given within 9 months. Isoniazid regimens in which the drug is given twice weekly should consist of at least 76 doses administered within 12 months (for the 9-month regimen) or at least 52 doses within 9 months (for the 6-month regimen). The usual adult dosage of isoniazid for treatment of latent tuberculosis infection is 5 mg/kg (up to 300 mg) once daily. If daily supervision is not possible in high-risk individuals who are likely to be noncompliant (e.g., the homeless, inmates of correctional facilities), the ATS and CDC recommend that a twice-weekly isoniazid regimen with direct supervision be used as an alternative to the preferred daily regimen; if this twice-weekly regimen is used, isoniazid is given in a dosage of 15 mg/kg (up to 900 mg) twice weekly. For treatment of latent tuberculosis infection in infants and children, the ATS and CDC recommend an isoniazid dosage of 10-20 mg/kg (up to 300 mg) daily. The AAP and others recommend a pediatric isoniazid dosage of 10-15 mg/kg (up to 300 mg) daily. When compliance with the daily regimen cannot be assured, the ATS and CDC suggest that children may receive 20-40 mg/kg (up to 900 mg) twice weekly. The AAP and others suggest that, when an intermittent regimen is used, children should receive 20-30 mg/kg (up to 900 mg) of isoniazid twice weekly (under supervised administration) for 9 months, preferably after completion of 1 month of daily isoniazid therapy. There is some evidence that adverse nervous system effects of isoniazid, cycloserine, and ethionamide may be additive; therefore, isoniazid should be used with caution in patients receiving cycloserine or ethionamide. Aminosalicylic acid appears to reduce the rate of acetylation of isoniazid; the effect is usually not clinically important. Isoniazid inhibits multiplication of BCG; therefore BCG vaccine may not be effective if administered during therapy with the drug. Initiation of isoniazid therapy (200 or 300 mg daily) in patients receiving carbamazepine has resulted in increased serum concentrations of the anticonvulsant and symptoms of carbamazepine toxicity, including ataxia, headache, vomiting, blurred vision, drowsiness, and confusion. These symptoms of carbamazepine toxicity subsided either when carbamazepine dosage was decreased or when the antituberculosis agent was discontinued. This interaction presumably occurs because isoniazid inhibits hepatic metabolism of carbamazepine. In at least one patient, concomitant use of carbamazepine and isoniazid also appeared to increase the risk of isoniazid-induced hepatotoxicity, apparently because the anticonvulsant promoted the metabolism of isoniazid to its hepatotoxic metabolites. If carbamazepine and isoniazid are administered concomitantly, serum concentrations of the anticonvulsant should be closely monitored and the patient observed for evidence of carbamazepine toxicity; carbamazepine dosage should be decreased if necessary. Isoniazid inhibits hepatic metabolism of phenytoin, resulting in increased plasma phenytoin concentrations and toxicity in some patients. Phenytoin toxicity occurs mainly in slow isoniazid inactivators and in patients receiving both isoniazid and aminosalicylic acid. Patients receiving isoniazid and phenytoin concurrently should be observed for evidence of phenytoin intoxication, and the dosage of the anticonvulsant should be reduced accordingly. Isoniazid appears to have some MAO-inhibiting activity. In addition, iproniazid, another antituberculosis agent structurally related to isoniazid that also possesses MAO-inhibiting activity, reportedly has resulted in serotonin syndrome in at least 2 patients when given in combination with meperidine. Pending further experience, clinicians should be aware of the potential for serotonin syndrome when isoniazid is given in combination with selective serotonin-reuptake inhibitor therapy or other serotonergic agents. Aluminum hydroxide gel decreases GI absorption of isoniazid; isoniazid should be administered at least 1 hour before the antacid. Coordination difficulties and psychotic episodes have occurred in patients receiving isoniazid and disulfiram concurrently, probably as a result of alterations in dopamine metabolism; concurrent administration of the drugs should be avoided. Isoniazid reportedly causes false-positive results with cupric sulfate solution (Benedict's reagent and Clinitest®) for urine glucose determinations. Overdosage of isoniazid has produced nausea, vomiting, dizziness, slurred speech, blurred vision, and visual hallucinations (including bright colors and strange designs). Symptoms of overdosage usually occur within 30 minutes to 3 hours following ingestion of the drug. After marked overdosage, respiratory distress and CNS depression, progressing rapidly from stupor to coma, severe intractable seizures, metabolic acidosis, acetonuria, and hyperglycemia have occurred. If untreated or treated inadequately, isoniazid overdosage may be fatal. Isoniazid-induced seizures are thought to be associated with decreased ?-aminobutyric acid (GABA) concentrations in the CNS, possibly resulting from inhibition by isoniazid of brain pyridoxal-5-phosphate activity. In the management of isoniazid overdosage, an airway should be secured and adequate respiratory exchange established immediately. Seizures may be controlled with IV administration of diazepam or short-acting barbiturates and a dosage of pyridoxine hydrochloride equal to the amount of isoniazid ingested. Generally, 1-4 g of pyridoxine hydrochloride is given IV followed by 1 g IM every 30 minutes until the entire dose has been given. If seizures are controlled and overdosage is recent (within 2-3 hours), the stomach should be emptied by gastric lavage. Blood gases, serum electrolytes, glucose, and BUN determinations should be performed. Blood should be typed and cross-matched in case hemodialysis is required. IV sodium bicarbonate should be administered to control metabolic acidosis and repeated as needed; dosage should be adjusted on the basis of laboratory test results. Pyridoxine has also had a beneficial effect in correcting acidosis in some patients, possibly by controlling seizures and resulting lactic acidosis. Pyridoxine has been effective in treating isoniazid-induced seizures as well as other mental status changes associated with isoniazid overdosage. In several patients who remained comatose following initial treatment of seizures with diazepam and pyridoxine, administration of an additional 3- to 5-g dose of pyridoxine hydrochloride after 36-42 hours of coma resulted in complete awakening within 30 minutes. The fact that administration of high doses of pyridoxine can result in adverse neurologic effects should be considered whenever the drug is used in the treatment of isoniazid-induced seizures and/or coma. Forced osmotic diuresis should be initiated as soon as possible following isoniazid overdosage to increase renal clearance of the drug and should be continued several hours after clinical improvement to ensure complete clearance of the drug and prevent relapse. Fluid intake and output should be monitored. In severe cases, hemodialysis or, if hemodialysis is not available, peritoneal dialysis should be used in conjunction with forced diuresis. In addition, measures should be taken to protect against hypoxia, hypotension, and aspiration pneumonitis. Isoniazid may be bacteriostatic or bactericidal in action, depending on the concentration of the drug attained at the site of infection and the susceptibility of the infecting organism. The exact mechanism of action of isoniazid has not been fully elucidated, but several mechanisms including interference with metabolism of bacterial proteins, nucleic acids, carbohydrates, and lipids have been proposed. One of the principal actions of the drug appears to be inhibition of mycolic acid synthesis in susceptible bacteria which results in loss of acid-fastness and disruption of the bacterial cell wall. Isoniazid is active against susceptible bacteria only when they are undergoing cell division. Susceptible bacteria may undergo 1 or 2 divisions before multiplication is arrested. Spectrum Isoniazid is a highly specific agent and is active only against organisms of the genus Mycobacterium. Isoniazid is active in vitro and in vivo against M. tuberculosis, M. bovis, and some strains of M. kansasii. In vitro, the minimum inhibitory concentration (MIC) for most susceptible mycobacteria is 0.02-0. mcg/mL in Lowenstein-Jensen media. Natural and acquired resistance to isoniazid have been demonstrated in vitro and in vivo in strains of M. tuberculosis. In vitro, resistance to isoniazid develops in a stepwise manner. The mechanism of resistance may be related to failure of the drug to penetrate or be taken up by the resistant bacteria. Resistant strains of initially susceptible bacteria develop rapidly if isoniazid is used alone in the treatment of clinical tuberculosis; however, development of resistance does not appear to be a major problem when the drug is used alone in preventive therapy. When isoniazid is combined with other antituberculosis agents in the treatment of clinical tuberculosis, emergence of resistant strains may be delayed or prevented. Isoniazid is readily absorbed from the GI tract and from IM injection sites. When administered orally with food, the extent of absorption and peak plasma concentrations of the drug may be reduced. Following oral administration, peak plasma concentrations of the drug are attained within 1-2 hours. In general, plasma concentrations of the drug in rapid isoniazid inactivators are 20-50% of those in slow isoniazid inactivators. In one study in healthy fasting adults, plasma concentrations of isoniazid 6 hours after a single oral dose of 9 mg/kg averaged 4.5 mcg/mL in slow inactivators and 1 mcg/mL in rapid inactivators. In a single-dose study in healthy fasting males, the extent of absorption (as measured by area under the plasma concentration-time curve) of isoniazid, rifampin, or pyrazinamide in dosages of 250 mg, 600 mg, or 1500 mg, respectively, was similar whether the drugs were administered individually as capsules (rifampin) and tablets (isoniazid and pyrazinamide) or as a fixed combination containing isoniazid 50 mg, rifampin 120 mg, and pyrazinamide 300 mg per tablet. Isoniazid is distributed into all body tissues and fluids. CSF concentrations of the drug are reported to be 90-100% of concurrent plasma concentrations. Isoniazid is not substantially bound to plasma proteins. Isoniazid readily crosses the placenta. Isoniazid is distributed into milk in concentrations approximately equal to maternal plasma concentrations. The plasma half-life of isoniazid in patients with normal renal and hepatic function ranges from 1-4 hours, depending on the rate of metabolism. The plasma half-life may be prolonged in patients with impaired hepatic function or severe renal impairment. 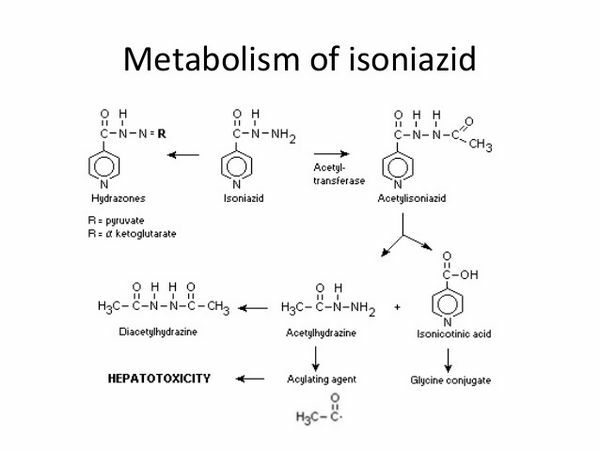 Isoniazid is inactivated in the liver, mainly by acetylation and dehydrazination. Metabolites of the drug include acetylisoniazid, isonicotinic acid, monoacetylhydrazine, diacetylhydrazine, and isonicotinyl glycine. The rate of acetylation is genetically determined and is subject to individual variation; however, it is usually constant for each person. Slow inactivation is an autosomal recessive trait and results from a relative deficiency of the hepatic enzyme N-acetyltransferase. Approximately 50% of whites and blacks are slow inactivators of isoniazid; the majority of native Alaskans, Japanese, and Chinese are rapid inactivators. Although more than 80% of native Alaskans, Japanese, and Chinese are rapid inactivators, some 30-50% overall would be homozygous rapid inactivators and the remaining would be heterozygous intermediate rapid inactivators. The rate of isoniazid acetylation does not appear to alter efficacy when the drug is administered daily or 2 or 3 times weekly; however, a relationship between rapid inactivation and poor therapeutic response has been noted in once-weekly intermittent regimens. Acetylation of acetylisoniazid results in the formation of monoacetylhydrazine which has been shown to be a potent hepatotoxin in animals. Microsomal metabolism of monoacetylhydrazine in animals results in production of a reactive acylating species capable of covalently binding with tissue macromolecules (i.e., liver protein) and subsequently causing hepatic necrosis. Although attempts have been made to correlate acetylator phenotype with risk of isoniazid-induced hepatotoxicity, published reports are equivocal, with some showing an association with slow inactivators and others showing an association with rapid inactivators. It has been suggested that acetylator phenotype is probably not a major determinant of isoniazid-induced hepatotoxicity, since the rate of acetylation of toxic monoacetylhydrazine to nontoxic diacetylhydrazine is also determined by acetylator phenotype. Thus, although rapid inactivators form more monoacetylhydrazine, they also inactivate it more rapidly. In adults with normal renal function, approximately 75-96% of a 5-mg/kg oral dose of isoniazid is excreted in urine within 24 hours as unchanged drug and metabolites. Small amounts of the drug are also excreted in saliva, sputum, and feces. Isoniazid is removed by hemodialysis or peritoneal dialysis. Isoniazid is a synthetic, isonicotinic acid-derivative antituberculosis agent. The drug occurs as colorless or white crystals or as a white, crystalline powder and has solubilities of approximately 125 mg/mL in water and 20 mg/mL in alcohol at 25°C. Isoniazid injection is a clear, colorless to faintly greenish-yellow liquid; sodium hydroxide and/or hydrochloric acid may have been added during manufacture to adjust the pH to 6-7. Oral isoniazid is commercially available alone, in fixed combination with rifampin, and in fixed combination with rifampin and pyrazinamide. Isoniazid preparations should be protected from light, air, and excessive heat. Isoniazid tablets should be stored in well-closed, light-resistant containers at a temperature less than 40°C, preferably between 15-30°C. Tablets containing the fixed combination of rifampin, isoniazid, and pyrazinamide (Rifater®) should be protected from excessive humidity and stored at 15-30°C. Isoniazid injection should be protected from light and stored at a temperature less than 40°C, preferably between 15-30°C; freezing should be avoided. At low temperatures, isoniazid in solution tends to crystallize, and the injection should be warmed to room temperature to redissolve the crystals prior to use.